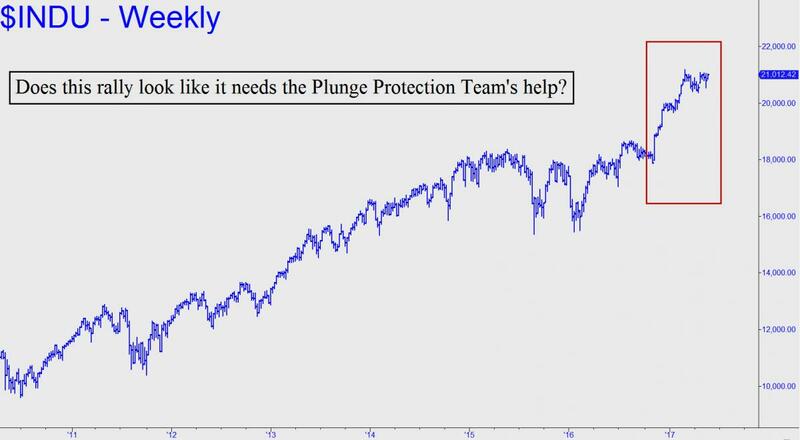 Zillionaire Asher Edelman was quoted on ZeroHedge the other day saying he has ‘no doubt’ that the Plunge Protection Team is behind the stock market’s steep rally since the election. With all due respect for Mr. Edelman and others who believe this, it is conspiracist poppycock. Yes, the Plunge Protection Team, which is officially known as the Working Group on Financial Markets, does exist, having been created under President Reagan. And I have no doubt that it will be pressed into action some day when the inevitable avalanche hits Wall Street. But the source of the stock market’s ongoing buoyancy at present is not the PPT, which has no reason to act unless there’s a crisis, but rather the unlimited sums of credit available at zero or near-zero interest rates to institutional investors and to companies that continuously buy back their own stock to artificially inflate earnings per share. This dynamic is quite sufficient to keep stocks buoyant as long as the easy-money spigot remains open. Moreover, the bullish effect on stocks is powerfully augmented by short-covering, the most urgent source of buying — indeed, the only source of buying sufficiently powerful to push the broad averages through heavy layers of supply en route to new record highs. With that kind of boost the stock market hardly needs the Plunge Protection Team to keep the bull market going. Ultimately, however, and as anyone familiar with the history of the stock market could tell you, when the forces of nature usher in a bear market, as is inevitable, the PPT will be powerless to affect it, let alone stop it.